At one point, there were several of them in Los Angeles but only one (the one on Wilshire opposite the Ambassador Hotel) was constructed so that when you walked in the front door, it looked like you were walking into a giant hat. That was the original Brown Derby, which opened on Valentine’s Day of either 1926 or 1929 (accounts differ) and moved one block away in 1937. The other main locations were (1) near Hollywood and Vine, (2) near Wilshire and Rodeo Drive in Beverly Hills, and (3) at Los Feliz Boulevard and Hillhurst in the Los Feliz area. There were also a few short-lived ones in other spots. All served mostly American fare in a semi-plush manner with very attentive service. Apart from the gimmick of the name and pretty good food, they had two things going for them. One was the Cobb Salad, which was invented at the Brown Derby, which was owned by the Cobb family. As the delicacy caught on in other eateries, there was much publicity as to where it had begun, and many people wanted to go and try the original. Many people also wanted to dine where the stars ate, and that was an even better reason to dine at the Derby. Like many restaurants where the big attraction is celebrity clientele, the proprietors advertised their famous patrons by covering the walls with their caricatures. The Brown Derby near Hollywood and Vine was situated in area from which many network radio shows were broadcast, so stars were always eating there. It was not uncommon for the cast of a program to do a performance for the East Coast, then repair to The Derby for food and libation before returning to the studio for the West Coast transmission. This caused the Brown Derby to be mentioned often on their shows. When TV shows began to emanate from some of the same studios in the fifties, there were occasional live remotes from that Brown Derby. The Ralph Edwards show, This is Your Life, always began by surprising some celebrity, often in a location very close to the studio from which the program was telecast. During the years that This is Your Life came from the Pantages Theater on Hollywood Boulevard, they often used the Derby, which was right around the corner. The night Edwards surprised Harold Lloyd there, Groucho Marx was in the next booth (on a break from filming You Bet Your Life at NBC’s nearby Sunset and Vine studio) and Marx began heckling Edwards as the latter attempted to hustle Mr. Lloyd across Vine Street. Well, who wouldn’t want to eat in a place where that kind of thing happened? The Sunset-Vine Brown Derby also had a lovely banquet room and courtyard so it was the scene of many wrap parties and show biz press gatherings. All that “in” spot mystique spilled over to the Beverly Hills location and gave it a similar rep. On I Love Lucy, when Lucy, Fred and Ethel arrived in Hollywood and wanted to go somewhere to see the stars, they went to the Brown Derby…where Lucy caused a plate of food to be dumped on the head of Brown Derby regular William Holden. That was probably good for another five years of tourists flocking to the place. Eventually though, business declined and Brown Derbies began closing down. I was an occasional patron of the Hollywood/Vine one in its last years, largely because I was working on a TV show that taped at the Sunset-Gower Studio a few blocks away. I recall being impressed with the history but unimpressed with the food…and somewhat bothered by the obsequious service. The host and waiters fawned over everyone who walked in the door like they were royalty and it seemed awfully antiquated and phony, at least to me. In any case, it was no longer the kind of place where Groucho and Bill Holden might drop by for a bite, so its main attraction was gone. That Derby closed in ’85, the same year the Los Feliz branch turned into a night club. 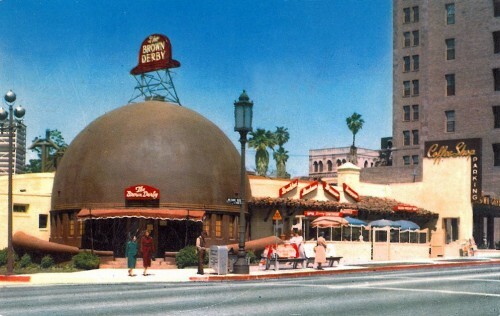 In the last few decades, much effort has gone into preserving the giant hat from the Wilshire location as a historical landmark. The only remaining Brown Derby is located at the Disney-MGM Studio theme park in Florida. I don’t know why they don’t buy the big hat and just ship it on down there. Another classic lost to time. When I was a child in the 60s, my great aunt resided, in her dotage, at the nearby at the Gaylord Hotel. We would sometimes eat at the Brown Derby when we visited her. I think the place was past its prime by then. On other occasions we would eat at The Bounty (roast beef of olde England and such) that I recall was on the ground floor of the Gaylord. The Derby has a very storied history, but my memories were those of a child. I don’t think I ever ventured back after she passed away in 1969. In the early to mid seventies I used to work at the Huntington Hartford Theater & have lunch at the Brown Derby Coffee Shop across the street on Vine. On a rare occasion I might dine in the Restaurant for Dinner with my Mom & or Dad. In those days the food was Great, the service was too. However, if a Celebrity was there the attention went to them First! Since then, other restaurants & coffee shops have tried to duplicate Derby’s Famous Salad, but it will never be quite the same. They had A+ Quality Match Books worth keeping, as my Dad said then. The Good Old Days! In fact, the original Brown Derby was locates in Malverne, NY – a small village on the south shore of Long Island. Founded and frequented by a number of the era’s most popular vaudevillians, the west coast version was founded in tribute to the east coast establishment they had frequented before heading to Hollywood. My father, Ray Murphy, was the fourth owner/operator of the original from 1980 until his passing in 1999. My brother and I closed the business but I still own a section of the original bar. If I had lots of Money I would of loved too get a nice Trailer & travel with my Sister to Hollywood . But I’m broke I am disable as well I was born 1. It’s hard for me too get around my Sister is so sweet she drives me around. I know I’m a pain to her alot. But She s a very great Cook very much better then I. She though me how too do your owne Salir Dressing & think up some new Resicpes. Her name is Mia. She s very smart very great in Bartendenr She s wow in drinks I wish I was as smart at my 3 Sisters where. My other Sister is dead so is my Oldrer Brother very sad too say. I thank you. My brother Jim was the mgr. of the Wilshire Blvd. BROWN DERBY opposite the Ambassador Hotel. The night Bobby Kennedy was murdered- – June 4, 1968 in the Ambassador – – the press covering his campaign came running into the Derby shouting “Kennedy has been shot in the Ambassador” and rushed to the Derby’s 3 pay phones to call in the news. That Cobb Salad is always a must when at Disney Hollywood Studios at Walt Disney World. I’ve never found one elsewhere that is as good, sure wish Disney would open one at Disneyland Resort. When I was in college I lived in an apartment on Alexandria. That was the side street next to ref Derby. It had once been “the” neighborhood with many mansions remaining. I was in a small place in a house once owned by Myrna Loy. It was two or three blocks from the Derby. Every month my godmother would send me $20 to spend on myself – not books or school supplies. I took that money and went to the famous Brown Derby for dinner (this was in the 60’s – $20 would buy dinner) It was a real treat eating in the famous hat shoes restaurant. I went back several times and the waiter remembered me. He used to treat me to a glass of wine with my meal. Of course I had the famous Cub Salad and heard the story of its creation. Fond memories of my dinners at the Derby. I tried the one on Vine st later, still good food and celebrity drawings but I missed eating in a hat. My first job out of college in 1967 was across a side street from the original Derby in the Equitable Building…My boss had standing lunch reservation for entertainment purposes…whenever he did not have a business lunch scheduled he would take one of his employees with him…I was one of the several times…great Cobb salad and martinis! I ate at the one on Wilshire which was on the opposite side of the street from the Ambassador. My Great Uncle James Wellington Warren was employed at the Hollywood and Vine restaurant for many years. He was born in Canada and emigrated to the USA in the early 1930’s. I believe he was in some sort of management position. I have a picture taken some time in the early 1950’s of my Aunt and Uncle (from Manitoba, Canada) sitting in a restaurant booth with her Uncle Jim and his wife Catherine. I also have a full dinner service from the restaurant from this time period. I would love hear from any source that could provide information about my Great Uncle and his association with the ” Brown derby”. I really adored the crabmeat/cheese appetizer. I would drizzle lemon on top, so yummy! Maybe I’ll try to recreate the dish. The Hollywood Brown Derby closed for the last time at its original site on April 3, 1985, as a result of a lease dispute. The Sunset-Vine Brown Derby also had a lovely banquet room and courtyard so it was the scene of many wrap parties and show biz press gatherings. All that “in” spot mystique spilled over to the Beverly Hills location and gave it a similar rep. I am so glad that the Broen Durby really existed. I am watching an Episode of I Love Lucy, Hollywood at last where Ethel, Fred and Lucy are having Lunch at the Brwon Durby! Was there ever such a recipe in the Brown Derby cookbooks? In his book titled “Palm Sunday,” (1981) Kurt Vonnegut joles that “Love” was invented by a chef at the Brown Derby Restaurant in Hollywood, California, in 1939. It consists of overripe jumbo peaches with San Fernando Valley honey and chocolate jimmies on top. It is traditionally served in heated purple bowls. Is there such a recipe in the Brown Derby cookbooks? My father Maurice was a chef at the Derby in the 60’s. I still have the original cookbook. He really enjoyed working there but then went on to other famous restaurants. My grandfather – Richard Wiggins – and I used to have lunch at the Brown Derby when I was 6 to 8 years old. He seemed to know many of the staff and they always brought him a telephone to our booth so he could make phone calls. I loved the place. It isn’t the same going to the BD at Disney Hollywood Studios, but, it is the closest I can get to those great memories! I was the CPA for the Original Brown Derby and was there to announce the closure of the restaurant in 1980. We did save the hat. It was a very sad day as most of the employees had been there for 40-50 years. Mark, I have a Souvenir Menu for the 30th anniversary — 1959. Let me know if you would like it. MR.MARK, THAT FIRST WEEK OF JULY IN 2015 I DID SEND YOU THE MESSAGE THAT I WAS HAVING THE HARDEST TIME TRYING TO SEND YOU THE PIC OF THE “MINI BROWN DERBY SUV HAT”! WELL, JUS TO LET YOU KNOW, WE STIL HAVE IT BUT HAVE NOT FOUND OUT ITS TRUE WORTH. IF YOU STIL HAVE ANY INTERREST IN THIS, PLEASE CONTACT ME AT 562 318 5521. OR SEND ME AN ADDRESS/E-MAIL TO SEND THE PIC TO. THANK YOU AND I’D APPRECIATE YOUR ANSWER BACK. THANKS AGAIN MARK. I have a cookbook I bought in the 1970s, 50th Anniversary of the Brown Derby Restaurant. If anyone has a great desire for a specific recipe I can check my book. I loved the Vine and Sunset location with the drawings, photos etc. Growing up in the Los Angeles area during the 50s and 60s was the best. I’ve got some interesting encounters with various celebrities during those decades. Mom always said that I should write a book. Remember the yummy cakes? One of my favorites recipes is the French Pancakes! Aaahh, those were the days. I purchased the 50th Anniversary Cookbook of the Brown Derby, Hollywood in the 1970s. it has the famous Grapefruit Cake recipe and I love the French Pancakes. If someone has a great desire for a specific recipe, I can check out my cookbook. I loved the place and the ambience there. Vine and Sunset. Growing up in the Los Angeles area in the 50s and 60s was the best. I’ve got a lot of interesting stories about various celebrity encounters during those decades. Mom used to tell me to write a book! The Brown Derby on Wilshire Blvd had the best Eggs Benedict I’ve ever eaten! In the 60’s we went there often for lunch as it was down the street from my husbands office. Good memories!! The link to the menu doesn’t work! Would you correct it please? Thank you! PS: Love your website providing us with The Brown Derby history. If anyone is sharing Derby recipes my family would love to have a copy. I remember when my mother Becky Armstrong worked in the Brown Derby back in the early 60’s and she would sneak me into the bar area while she worked. My mother most likely in the year of 1963/64 dated Chris Shankles “sportscaster”. If anyone who remembers my mother Becky, I would love too hear from you. She was approx. 5’4, long blonde hair and had a look of Marilyn Monroe. I too along with Heather ^ would also like the crab meat appetizer receipe from the 80’s-90’s that came in a foiled shaped shell. It seemed to have a mild cheese flavor to it. Any ideas? Recently found a 1947 luncheon menu from the Brown Derby. Has a map on the front showing the location of the restaurant and various Hollywood landmarks. Jumbo shrimp cocktail was $1.20 !!! Any interest? Does this menu have any value? Thinking of putting it on eBay. Thanks. My “other” childhood neighborhood from Capitol Record to Music City. Aunts at the Derby. Dad at the Plaza, later Roosevelt. Mom at The Broadway. And what do I remember most? The train models outside the Santa Fe ticket agency just across and down Vine from Derby! Their Sardines and Sour Cream recipes was served in the 1940- My parents took me to the Brown Derby and we saw several 1930 film stars. The sardine side dish had white onions and the sour cream was fluffy. Cobb Salad, Crab and Shrimp Baked appetizer. Armida..use the Restaurantware Collectors Network (RWCN). If it is not already identified, they’ll go to work ferreting out the facts for you. There are lots of resources there to help you with restaurant china. Hi. I am a big fan of the brown derby. My father worked there when he was a young man. I bought an expresso cup and saucer on eBay from the royal porcelain co. And am wondering if it is authentic. When did the name change to , The Hollywood Brown Deby ., Instead of , The Brown Derby ? I have a dinner plate and want to know if it’s original or was it made once they started Franchising the restaurant ? Please Help Thank You …. Ben Judd, can you show me a photo of the painting. I am looking for two recipes from the Brown Derby.One was a drink called a”Grogg”.The drink took a special created syrup mix.I am also looking for their bar cheese recipe.My husband reminisce about the foods often.If anyone can help,please do. I have a painting of swans with a bamboo matte and frame painted by the artist Annette Honeywell. On the back my maternal grandmother had written that it was from the original Brown Derby on whilshire blvd. The back ground I have from my mother, who is now 83years young that connects with the Brown Derby is my grandfather’s sister Harriet Horton was married to Charlie Yager who opened the first auto garage on the corner of Hollywood and vine. They (charlie and Harriet ) lived in the same apt building as Gloria Swanson and at that time husband Wallace Beery. They were all friends and would play cards together. My grandfather would drive the cars back to the owners, He told of delivering Spencer Tracy’s car. My grandparents lived in Hawthorne all of my life and I am 59. I am positive that what my grandmother wrote on the back is true, But I am trying to authenticate somehow. The colors and framing match the décor of the bamboo room. Idon’t know how long it hung at the Brown Derby or if it was used for the opening. I am trying to locate any pictures from inside the bamboo room at that time that might have the painting in it! Does anyone have any of these photos? I have had a hard time finding any from the inside! I once spoke with chris Nicholes from LA Magazine and none of his contacts reconized it. My Grandfather loved history and passed that on to me. If this painting is from the Brown Derby I would hate for it to lose it’s place in history. Will be happy to send a photo to anyone interested. P.S. I spoke to one of Annette Honeywell’s granddaughters, who knew nothing of the painting, But had fond memories of her grandmother taking her to the Derby for lunch after the beach. Thanks and any help would be greatly appreciated! The recipe for chili was on the label of the Spice Islands chili powder. I have lost my jar and would appreciate having the recipe again. I am very deeply sadden by this I never have money too go see it or other things there I’m not rich I support my Elderly Parents & my small puppy I would love too bye a used RV class c too take my Parents my Mother & Father on a trip before they pass on???????????????? Why in the world they took down the Brown durby why I though it was very sweet lovely too be there i never ever got too see it??????????????????????????????????????????????? ?why did it leave why??????????????????????????????????????????? ?this makes me very sad . Hello there, I am DESPERATELY searching for the crab and shrimp bake appetizer/ side dish that can in the little foul sea shell. PLEASE PLEASE PLEASE!! !